After a fire sweeps through your bushland property it is always an interesting though anxious time waiting for the plants to recovery. When some of those plants are listed under the Threatened Species Conservation Act (1995), the angst is doubled. 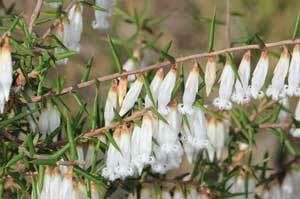 So it was for us as we watched for the re-appearance of the endangered species Leucopogon fletcheri subsp. fletcheri and the endangered population of Pultenaea villifera var. villifera that grew on our place in Winmalee prior to an escaped hazard reduction in September 2013. 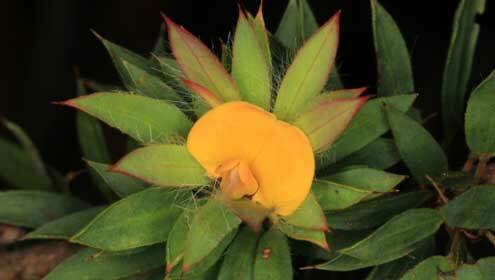 In the Blue Mountains Pultenaea villifera grows in a few small stands on clay soils primarily on private property from Warrimoo to Winmalee. It flowers sparsely and sporadically through the year with flowers spaced along graceful arching branches. Leucopogon fletcheri subsp. fletcheri was first collected by J.J. Fletcher in 1887 in North Springwood. It has also been recorded from Winmalee where its stunningly white pendant flowers make it easy to spot in early Spring in rocky sandstone locations. Our property is protected from development and disturbance by a Conservation Agreement with the NSW State Government, partly because of the presence of these endangered plants, but that doesn't of course stop damage by fire. We knew that both species should recover from the 2013 fire; they had done so following the January 1994 Grose valley fire, as well as from a hazard reduction in the 1980s. As the rest of the bush regenerated we waited … and waited for any sign of the Pultenaea and Leucopogon seedlings. By late April of 2015 just as we started to become quite concerned that both species had been lost we spotted the first specimens of Pultenaea villifera each with just a few sets of their distinctively hairy leaves. One 'advanced' plant only 6cm high even had a flower. Perhaps it had taken the late summer/autumn rains to promote germination of seed that have been heat treated by the fire almost 18 months before. There are now over 150 specimens in an area of about 400 square metres. Leucopogon fletcheri was even tardier. We did not see the first tiny seedlings until the very end of May 2015. Suddenly there they were with their characteristic incredibly pungent leaves and near-parallel leaf venation distinguishing them from the range of other pointed-leaved species in our bush. Even now we don't know exactly how many there are as we daren't walk among the still tiny fragile survivors. The return of these species to our bushland has been a very special and emotional experience. It's like having all of the members of a precious family finally assembled again in the one place after a long absence. Our challenge will now be to provide continued protection for two species that are slow to germinate, flower and seed, and which both have a preference for living right on the edge of, or even worse, across our bush track which doubles as the NPWS access track and fire trail. No wonder they're endangered. The article above first appeared in the August, 2015 edition of Hut News, and was revised for this website in June 2016.